The media is buzzing with allegations that Nobel Peace Prize nominee Greg Mortenson fabricated his bestselling books and misused millions of dollars in donations. Amazingly, within days of 60 Minutes breaking the story, a new book was already released about it. Only don’t call it a “book.” Byliner, the company that published it, is touchy about this, because this format is really something new. After all, we didn’t call blog posts articles, because blogging was a new kind of news. But there’s not another good word for what this is. This isn’t some longer, rushed blog post released on a Kindle. 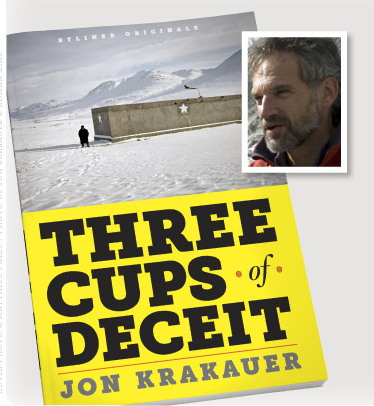 Called “Three Cups of Deceit,” it’s written by award-winning author Jon Krakauer, painstakingly edited and even available to download for free for the first 72 hours of its launch. Welcome to the stunning, new rapid-fire world of long-form publishing. Singles– as Amazon calls them– are like books, but meant to be read in a two-hour sitting, delivered quickly and electronically without the usual publishing house lags. The company releasing the book-like-thing burst on the scene yesterday too. I first met with Byliner’s co-founder and CEO John Tayman a few weeks ago, at the request of a friend who was thinking about investing and wanted an author’s take. Byliner has raised just under $1 million in funding from Freestyle Capital, SoftTechVC and other individuals including Andrew Anker, Karl Jacob and Russ Siegelman. The company officially launches in May. So know reading this that I’ve become fully-biased since I met the company and am now betting on Byliner with my own time and my own name. I don’t know if it can get big enough to score a venture-style return, but it’s one of the first things that’s truly excited me about the future of high-quality, long-form journalism in more than a decade. Or, at least, half of Byliner’s business excites me. The other half I fear is a distraction from the more exciting side of the business. Let’s talk about that one first. Byliner.com is a discovery engine for readers to find great long form content. Say you like the style of Michael Lewis; Byliner will recommend other less-well-known, long-form journalists you might enjoy. It’s a rich database filled with back-catalogs of magazines, newspapers and the Web and a great way to find forgotten long-form pieces on a variety of subjects. My issue isn’t with the UI or the mission of Byliner.com. I just don’t think people are sitting around waiting for more long-form pieces to read. If you’re like me you already have a stack of books you are trying to find time to get through and stacks back issues of the New Yorker, the Economist and Vanity Fair are taking over your house. My problem has never been finding more great long-form stuff to read– my problem is finding time to read it. I think there’s a niche group who will love this site. But largely, I think it’s designed for a mass audience that reporters like me wish existed. It’s one of those sites designed for the way we wish we were and the time we wish we had– never a great starting point when it comes to the consumer Web. And, I’m not sure it allows you to find the best content, because even magazines and newspapers have been moving towards shorter and shorter articles. I doubt most up and coming reporters get much of an opportunity to write pieces that are more than 3,000 words long. I’ve probably written ten in 15 years. But that erosion of the art of long form is exactly why I was so excited by the other half to Byliner’s business: A new publishing house designed from the ground up to take advantage of the immediacy of digital publishing, and yet, keep the best aspects of a traditional publishing house at the same time. Authors will spend a few months– not years– writing, and Byliner will invest in real editing of the piece. That’s something traditional publishers no longer do, and most writers I know yearn for. Great writers can always benefit from great editors, and great editors are disappearing from journalism and publishing. The singles are turned around in a matter of days and weeks, not months or years. In the case of “Three Cups of Deceit”, new reporting was added just hours before publication. I assumed to get all of these benefits, and to sign with an upstart publishing brand, authors would have to sacrifice economics. But Byliner is even competitive on that one, largely because it’s stripping so many unnecessary bloated costs out of the publishing model. The authors assume none of the back-end costs – unlike a vanity self-publishing label – and are instead simply paid for their work. And they’re paid pretty well. Byliner doesn’t disclose what it pays for advances, and it will probably change over time depending on the imprint’s success, but right now we’re not talking about anything close to jaw-dropping 6-figure deals. Yet the advances are comparable with what many lesser-known authors and journeyman journalists I know have been paid to write a book; and remember– these aren’t the length of full-books. Byliner splits revenues with authors 50/50. Tayman hopes that Byliner.com will be key to marketing the singles, and that the label’s curatorial eye will lend cache to being a “Byliner original.” That cache is important. In the old media world, there’s a big difference between having a publishing house and self-publishing. It not only effects distribution and press, but it effects how seriously people take you as an author. There are about a dozen authors with contracts so far, and Byliner will be actively signing more (the company’s first few singles have been announced here). Its goal is to release a new single every 10-to-14 days, and it’s not afraid to be current. The label just sent National Book Award winner William Vollmann to Japan for two weeks to write a first-hand account of life in the nuclear evacuation zone. Byliner may wind up disrupting the likes of Vanity Fair and the New Yorker more than it disrupts publishing houses. If blogs deconstructed the breaking news element of newspapers and magazines, Byliner is trying to disrupt the investigative cover story.